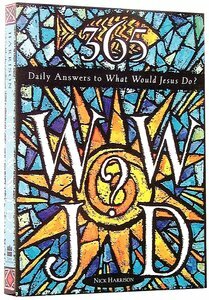 365 Daily Answers to What Would Jesus Do? What Would Jesus Do? Ask the question and live the answers, every day of the year! These devotional readings from Scripture and notable Christian writers will nourish your faith through the simple daily practice of asking this vital question. About "365 Daily Answers to What Would Jesus Do?" The recent phenomenon of accessories bearing the 'WWJD' (What Would Jesus Do?) has sparked a renewed awareness of weighing everyday actions against the life of Jesus and here is a daily devotional for the millions inspired by this popular reminder of Christian values in daily living. This one-of-a-kind collection of devotional readings will help you nourish and deepen your faith through the simple yet powerful daily practice of answering the question, "What would Jesus do?" A jewel of wisdom for every day of the year, each entry is drawn from Scripture with practical reflections on how we can live the WWJD? life as well as inspiring words from notable Christian writers, such as Dietrich Bonhoeffer, Richard J. Foster, Charles H. Spurgeon, Billy Graham, Elisabeth Elliott, Martin Luther King Jr.,C.S. Lewis, Eugene Peterson, and many others. Here, author Nick Harrison invites us to accept this same challenge. It is "a pledge that the Apostle John says is a surefire test of our Christian faith....One year from now, may our lives be richer for having taken the time to learn the lessons gained by answering 'What would Jesus do?'" 365 WWJD? offers people of all ages daily food for thought, warmly reminding us of the many ways we can model our everyday actions after the life of Jesus. Nick Harrison has authored the best-sellers 'Promises to Keep: Daily Devotions for Men Seekintg Integrity' and 365 WWJD: Daily Answers to 'What Would Jesus Do? ', as well as 'His Victorious Indwelling.' Nick and his wife, Beverly, are the parents of three daughters and live in Eugene, Oregon.